Internationals were disturbed at the Palestinian outpost* in Bil’in by Israeli military vehicles both during daytime and in the middle of the night. On the night of July 31st at 11:30 pm, the IOF (Israeli Occupation Force) drove a military vehicle directly into the shelter where internationals were sleeping, revved their engines and shone their headlights into it. They did this on a number of other occasions during the days before this incident. In response, the internationals consulted the popular committee of Bil’in about the idea of constructing a “roadblock” with large stones to prevent the Israeli military vehicles coming too close to the outpost. The committee agreed with this idea and so five internationals moved a large number of rocks across the approach road to the shelter. Since then, the army vehicles have been kept away from the outpost. On the afternoon of August 4th, a few hours after the weekly demonstration, four soldiers came to the outpost and entered the shelter. The soldiers then attempted to tear down the Palestinian flags that where adorning the outpost. They succeeded in snatching two of the flags, while verbally abusing the one International present. 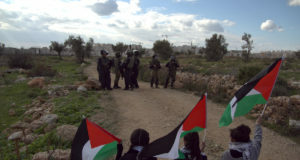 This harassment has occurred over a number of days when the Israeli soldiers, who controlled the gate between Bil’in village and the outpost, had several times refused access to Internationals. On August 5th, two internationals were not allowed to pass the gate with flags which were brought to replace the stolen ones. The internationals were told that they were not allowed to bring Palestinian flags across the barrier as it was “Israeli land” beyond. *The outpost is two structures built by the people of Bil’in on land they own, which is separated from them by the Annexation Barrier. 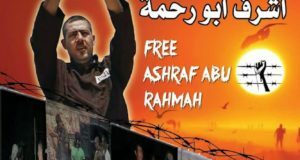 It is near the settlement of Matityahu Mizrakh and is an important site for the non-violent joint struggle between Palestinians, Israelis, and internationals. 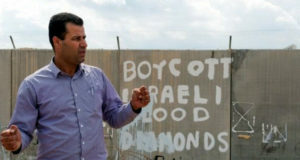 The people of Bil’in with Israeli and international peace activists maintain a 24 hour presence at the outpost. There is a demolition order issued on the two small structures that make up the outpost, while the extensive and much larger buildings that make up the settlement housing complexes, which were also built illegally under Israeli law, have no such order threatening them. All Israeli settlement structures are illegal under international law.